Earlier in the week, speaking to RT Spanish, Morales pointed out, “If there were a request, of course we would be willing to debate and consider the idea." "We are open, respectful of the right to asylum, and it is clear that if circumstances permit it, we would receive Snowden with pleasure and give him asylum here in Nicaragua," Nicaragua's President Daniel Ortega said at a public event. Maduro, who often employs the same boisterous rhetoric employed by his predecessor and mentor, Hugo Chavez, has said Venezuela will shield the whistleblower from prosecution by the US. The leader of Venezuela’s political opposition, Henrique Capriles Radonski, criticized the asylum offer extended by President Maduro, and took the opportunity to tie Maduro’s move to ongoing domestic politics. 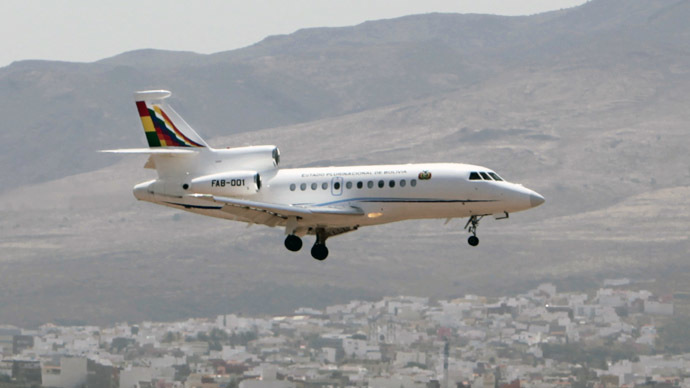 The three offers for political asylum from Central and South America come on the heels of an emergency UNASUR bloc meeting which was held Thursday in Cochabamba, Bolivia following an incident in which Bolivian president Evo Morales was denied entry into French airspace. Morales’ plane was forced out of European airspace and to make an unexpected landing in Austria after a US diplomat lied about NSA whistleblower Edward Snowden being onboard, local media reported. The plane had departed from Moscow on July 2, but had to land in Vienna, Austria, and remain grounded for 12 hours as France, Spain and Portugal closed their airspace for transit over a suspicion it could have been carrying NSA leaker Edward Snowden. 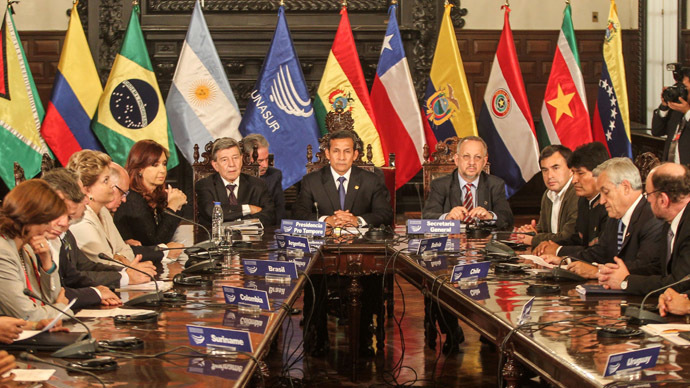 The Thursday meeting of the Latin American bloc was attended by the leaders of Argentina, Venezuela, Ecuador, Uruguay, Suriname and Bolivia with representatives of Brazil, Chile and Peru also in attendance. 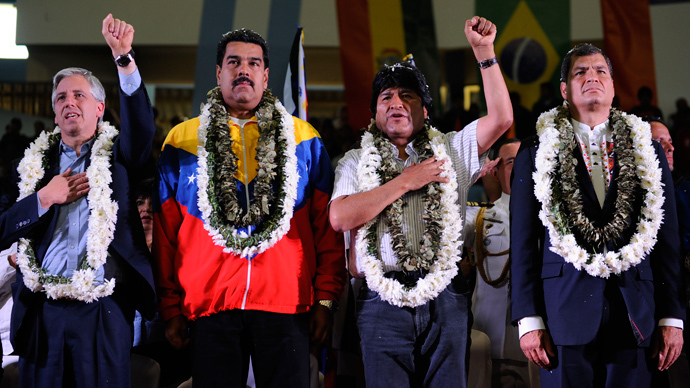 Following the emergency summit, the bloc issued a statement which voiced support for Morales and expressed indignation at Tuesday's moves by France, Portugal, Italy and Spain to obstruct the Bolivian head of state’s aircraft from free passage. The incident "set a dangerous precedent of violating international laws" in the world, the statement said. "The European people have seen the cowardice and the weakness of their governments, which now look like colonies of the United States," the Venezuelan president said of the episode. The asylum offers by Bolivia, Venezuela and Nicaragua suggest they may be related to coordination following UNASUR’s assembly. Moreover, the announcements by those countries come at an opportune time for Snowden, as Moscow has been voicing increasing irritation at his continued presence in Russia, and a bid for Icelandic citizenship failed after the country's parliament voted not to debate it on Friday before its summer recess. On Thursday Russia’s deputy foreign minister Sergey Ryabkov said that Snowden has not applied for political asylum in Russia, so it is not in Moscow’s power to decide his destiny. "He needs to choose a place to go," said Ryabkov. “We believe that without his determined personal decision in one direction or another, without his exact understanding of what is better for him, what solution he considers to be the optimal one, we are unable to decide for him,” he added. Snowden has been making a slew of asylum requests, with legal help from WikiLeaks and direct intervention on his behalf coming directly from Julian Assange, himself still receiving an asylum at Ecuador’s London Embassy for the past year. On Friday, WikiLeaks announced that six additional asylum bids had been made on behalf of Snowden, bringing the total number to 27, though many countries had so far declined to extend any political or legal protection to the whistleblower. Eleven nations have already rejected the whistleblower's requests, including France, Finland, Brazil, Poland, India and Germany, leaving him trapped in Moscow’s Sheremetyevo airport. New Delhi said on Tuesday that it has “no reason” to grant the whistleblower’s request. In his application to Poland, Snowden said that he risks facing execution if he is returned to the US. Spain, Norway, Italy, Ecuador and Austria stated that asylum requests cannot be granted unless the applicant is inside the country. Italy also said that Snowden’s application was made via fax, which is not allowed, ITAR-TASS reported, citing a source in the Italian Foreign Ministry. France went a step further, saying that Snowden would be arrested if he were to enter the country due to an existing US extradition request. In contrast, President Maduro extended congratulations to Snowden during his comments on Friday. 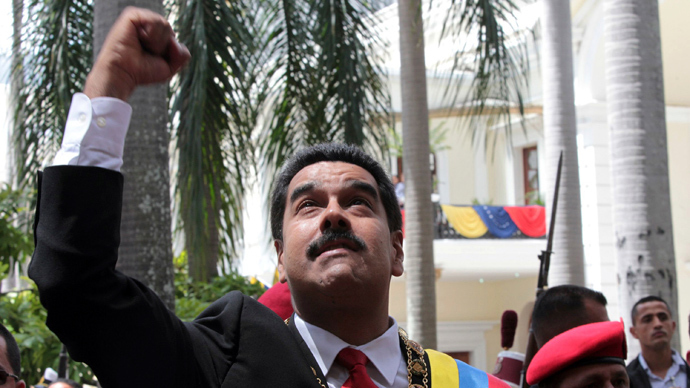 "He has told the truth, in the spirit of rebellion, about the US spying on the whole world," Maduro said. "Who is the guilty one? A young man ... who denounces war plans, or the US government which launches bombs and arms the terrorist Syrian opposition against the people and legitimate President Bashar al-Assad?" "Who is the terrorist? Who is the global delinquent?” added Maduro. The White House declined to comment on Venezuela’s asylum offer.